In-office level Vision Therapy in the comfort of your home? This is big. This is life changing. 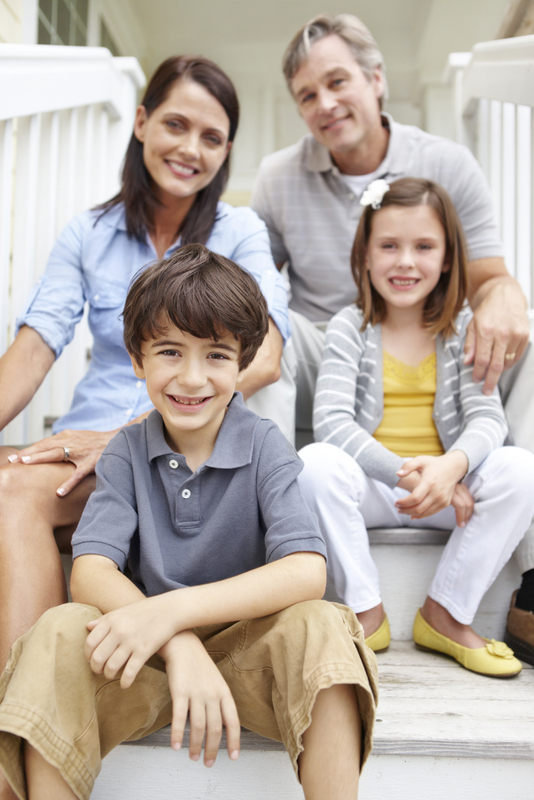 A better future for your family starts here. 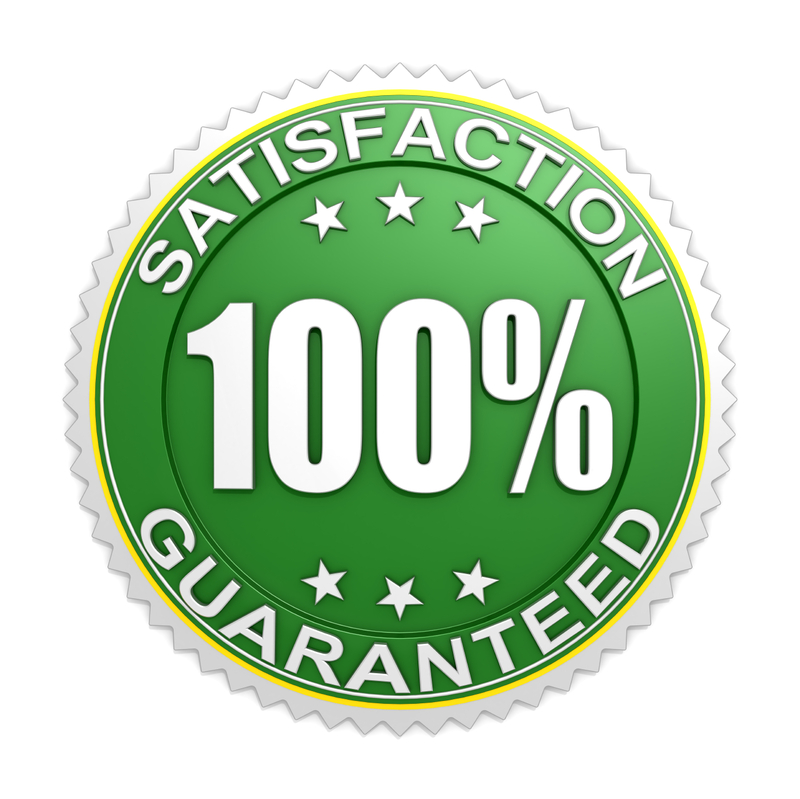 With our 30-day, no-questions-asked satisfaction guarantee, you have nothing to lose. And a whole new life to gain. Does any of this sound like you or your child? Our clients are stunned to find out that all of the above challenges can come back to VISION. Vision and eyesight are not the same thing. You can have 20/20 eyesight and still face functional vision problems. And those problems can have a serious effect on your quality of life. 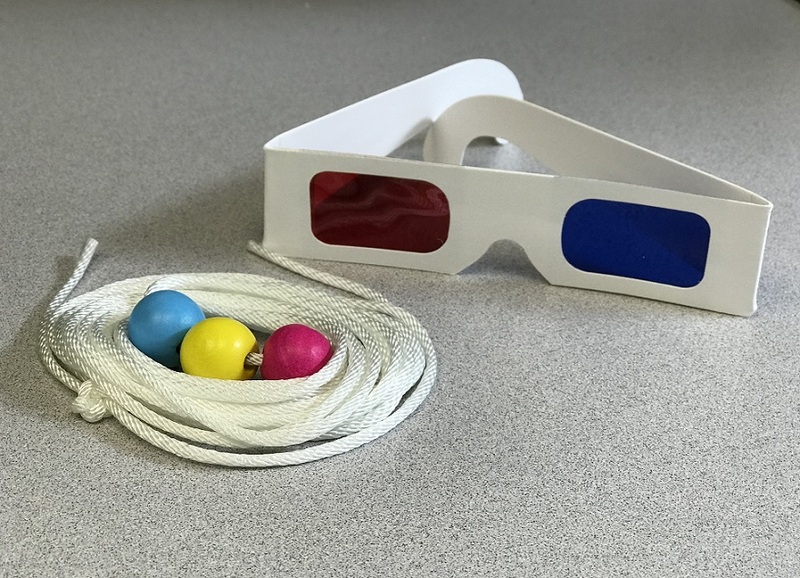 Vision Therapy feels like magic, but it’s rooted in rock-solid science. It’s not new. We’ve been successfully treating children and adults for decades in our in-office setting, and the results speak for themselves. We’ve seen non-readers turn into bookworms. We’ve seen failing students turn into straight-A students. We’ve seen families at the breaking point resolve their battles. We’ve seen uncoordinated people excel at sports. We’ve seen formerly stubborn students drop everything to complete their homework as soon as they get home. We’ve seen children previously thought to have learning disabilities turn out to only have vision problems. We’ve seen entire lives and families transformed. Vision Therapy is proven and powerful. It’s also a commitment. Many busy families simply haven’t been able to find the time to visit an office regularly enough to complete a comprehensive program. That has all changed. 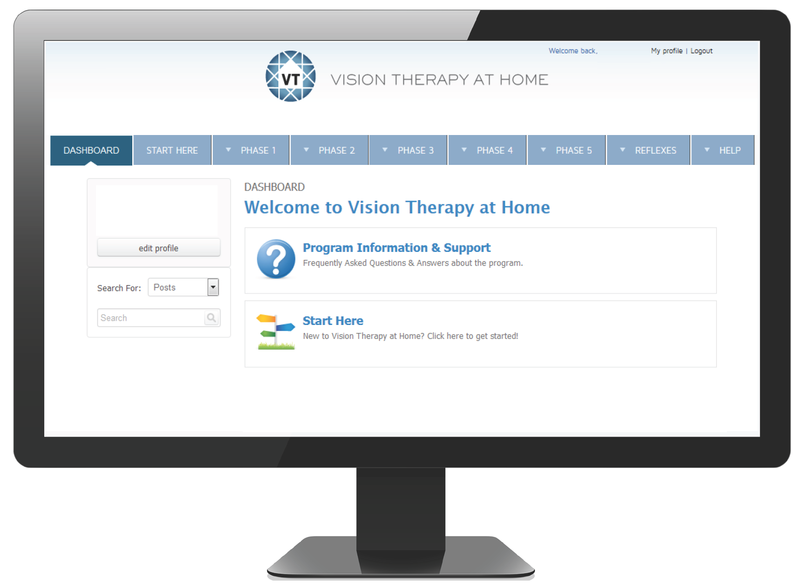 Vision Therapy at Home takes the our in-office program and packages it in a convenient program accessed online so you can get results in your free time in the comfort of your home. My kid is so smart, but something is holding them back. We hear you. We understand. You’ve come to the right place. Let’s change your future. It starts today. It starts here. Meet Johnny. Johnny likes to play with his friends. He likes sports, though he’s not serious about it. He’s not a fan of school. He would rather play video games than read. He’s a good kid overall—not a troublemaker at school, though his grades have been slipping and tensions are rising at home. Homework has become a nightly battle. His parents know he’s smart, so they are frustrated that he doesn’t seem to be trying hard enough. Johnny isn’t sure what’s wrong, but school keeps getting harder for him. He feels dumb. It seems like all his friends figure everything out easily while everything takes him longer. His friends are even better than him at sports. His confidence is dropping, and his parents don’t get it. They just keep getting upset with him. We can help. The sooner you start, the sooner things can get better. VISION THERAPY AT HOME is the first and only comprehensive vision therapy program designed for the comfort of your own home. Modeled after our extraordinarily successful in-office programs, the Vision Therapy at Home program addresses the same root causes of vision-related struggles — and you can do it all in your living room. A doctor created program, with more than 80 specialized activities, specifically designed to address functional vision issues. These activities are designed to get you off your screens and up and moving…just like real life! Access to the online portal for a full two years. Most people complete the program in one year. We encourage patients to be consistent and stick with the recommended timeline for optimal results, but we also know that everyone learns at his or her own pace. That’s why we extend a second year of access at no additional charge. Five easy-to-follow phases released in 10-week intervals. Each phase comes with clear directions so you can get right to work. Just like building a house – a good Vision Therapy program always starts at the foundation and builds towards higher level skills. 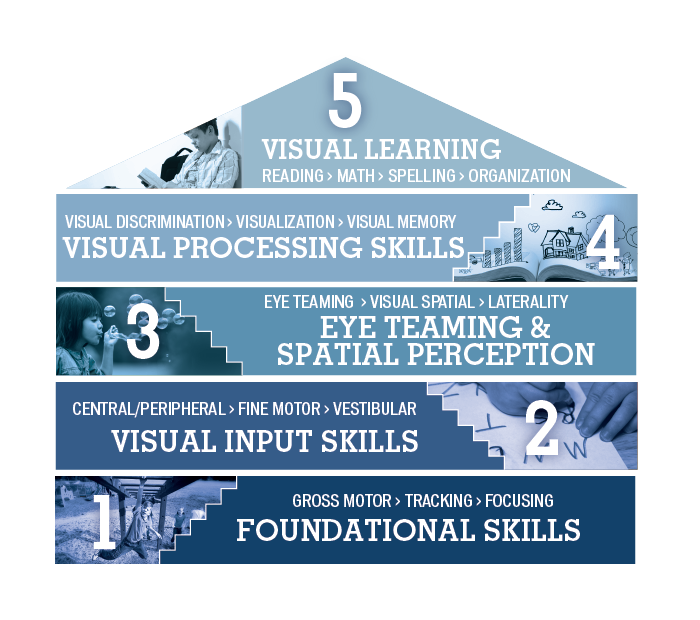 We start with Foundational Skills in Phase 1 and work our way up to Visual Learning skills in Phase 5. Phase 1 gets the ball rolling, laying the foundation for a better visual system. 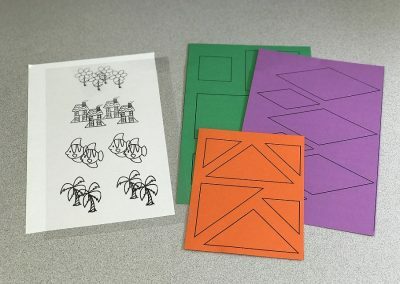 These activities work on basic visual skills that are important for learning – skills like eye movements (tracking), focusing, and gross motor. All activities are designed to reinforce and eventually establish new visual skills to make reading, writing, and eye-hand coordination easier. Phase 2 includes multitasking activities to help integrate the senses. 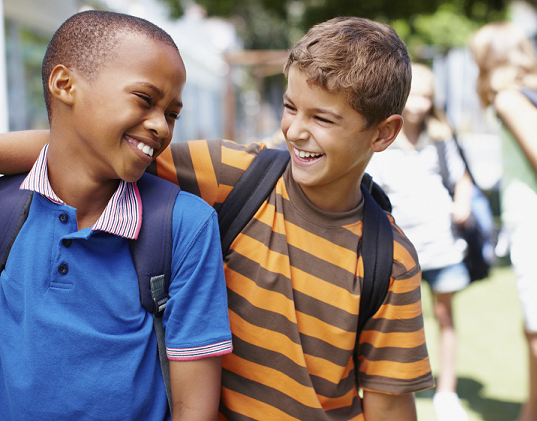 These activities allow us to develop more complex skills that can be applied to everyday life. 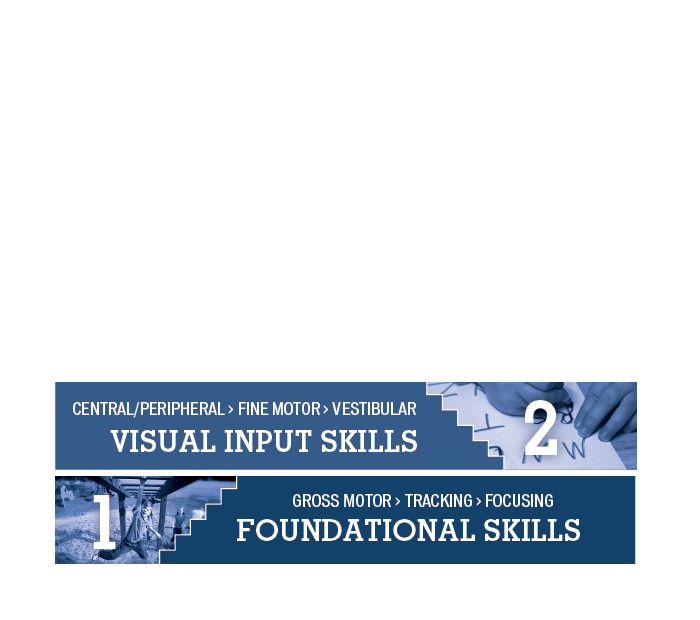 When these skills become automatic, it’s easier to copy from the board, read, write, and more.n This Phase also includes activities that work on fine-motor skills (think: effective pencil grip). 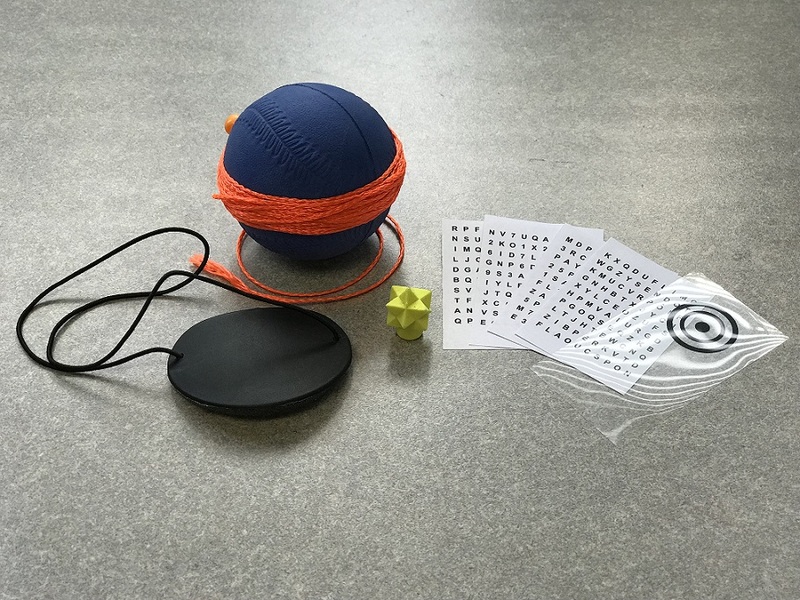 Phase 3 includes activities that work on eye teaming (binocular vision) skills, laterality, and spatial perception. When your eyes work effectively as a team, the world opens up to you. This Phase begins to integrate computer activities via the VisionBuilder computer program. This is where the rubber meets the road. Phase 4 includes activities that continue to enhance visual efficiency and visual processing, as we put the skills learned in previous phases into practice and reinforce them. This Phase focuses on Visual Discrimination, Visualization, and Visual Memory skill development. These skills are critical for reading fluency, writing, spelling, and daily living. 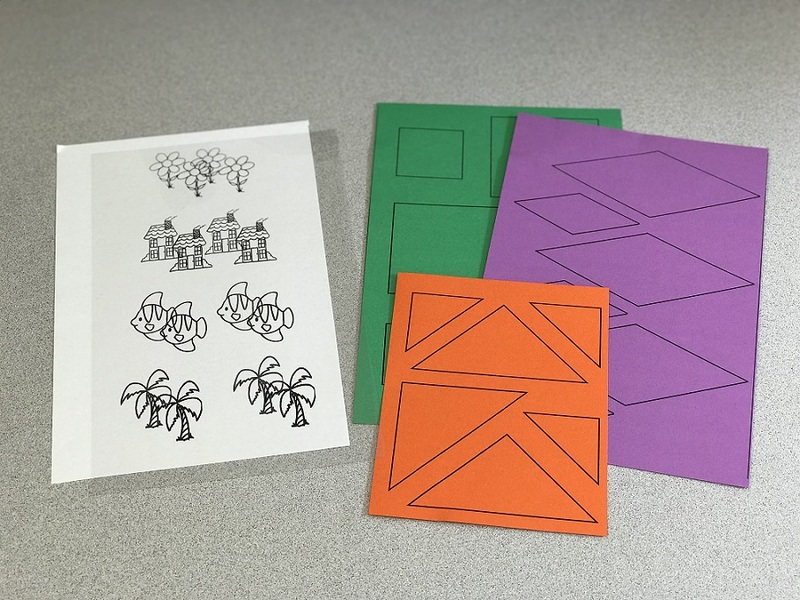 In Phase 5, you’ll explore activities that encourage strategies for learning in a more visual way. 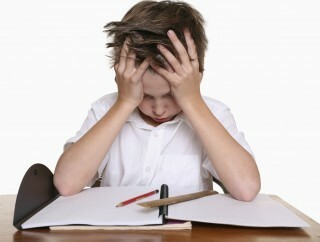 Visual learning makes innumerable things easier: memorizing, reading, spelling, math, and more. Are all the activities done on the computer? Our program is accessed through the online portal – where you will get activity directions, schedules, and instructional videos. The activities themselves are done in “real space” away from the computer. This is important because we live in “real space” and completing the activities in this way encourages depth perception, spatial awareness, and overall coordination. We incorporate some computer-based activities that enhance our program. I read that there are different types of vision problems. How do I if my situation is a good fit? The Vision Therapy at Home program addresses many visual diagnoses and symptoms. For more information, check out the Who is a good candidate? page. Do I need to have previous experience with vision therapy for the program to work? No! You don’t need to know anything about vision therapy to get started. This program is designed for home-use. Is Vision Therapy at Home as good as the in-office program? Vision Therapy at Home covers all the functional vision therapy areas that we cover in our extraordinarily successful in-office program. 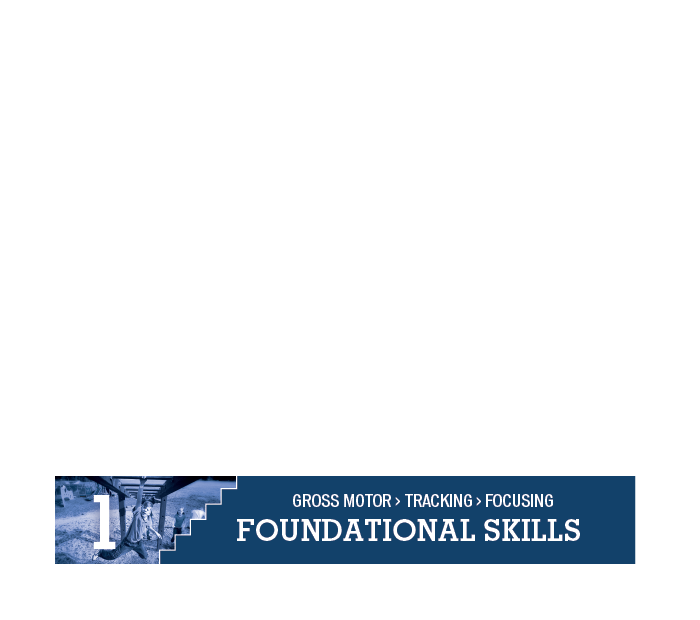 It addresses foundational skills: gross motor, eye tracking, and focusing. 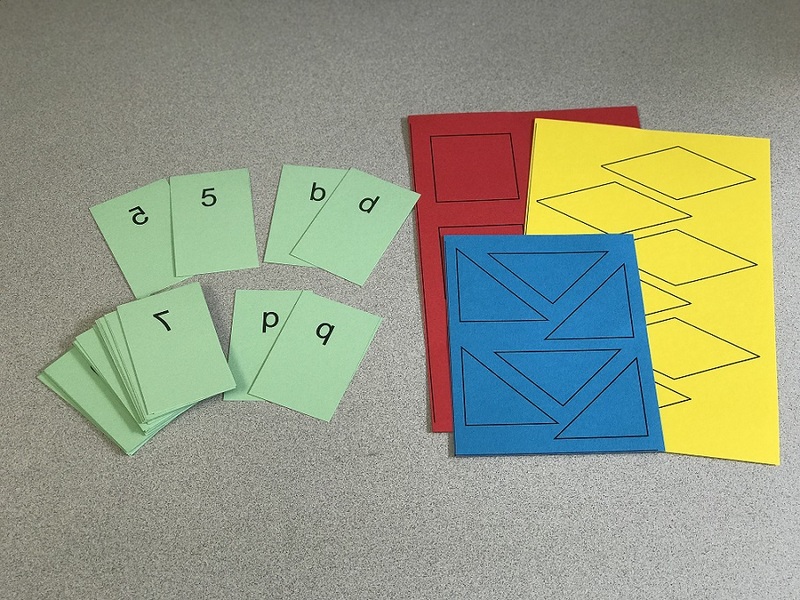 Then we progress to eye teaming (binocularity), visual processing skills, and visual learning. That sounds like gibberish. We get it! And it’s not a problem. Like we said; no previous experience is necessary. Our program will walk you through the process, step-by-step. And we’re always here to help. 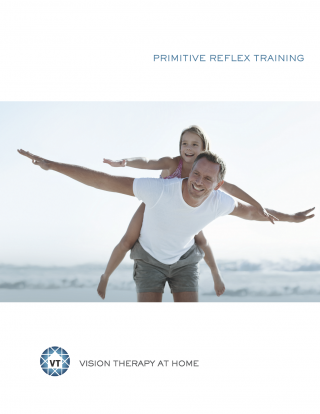 We have included the Primitive Reflex Training activities intertwined into the program for added benefit! Reflexes can be a huge roadblock for some kids and the VTAH program wouldn’t be complete without it. 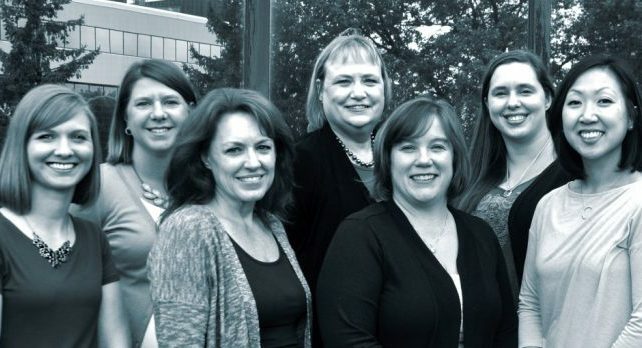 You will have unlimited access to our board-certified vision therapist staff. Send a quick email or set up a quick phone call – we’re here to answer your questions along the way. This kit includes all specialized materials for the entire program, plus FREE shipping US or international. At $1297 for the entire program – including full access for two years – this is the investment of a lifetime. We offer a 30-day, money-back guarantee. Try out the program for a full 30 days in the comfort of your home. If for any reason you are not satisfied with your purchase, simply contact us for a FULL refund. You have nothing to lose. And a whole new life to gain. Want more proof that this program changes lives? We hear similar stories all the time…I know my child is smart but something is holding them back. 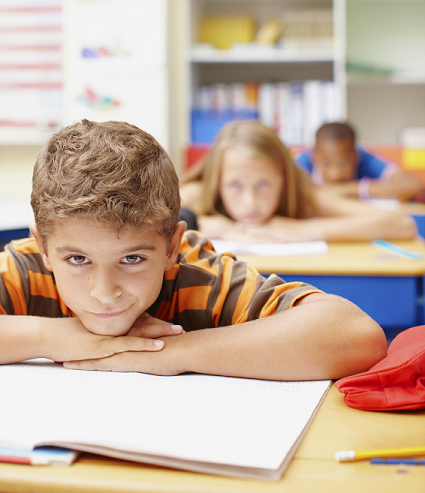 I’ve tried everything to help my child, but nothing seems to help them with school work. 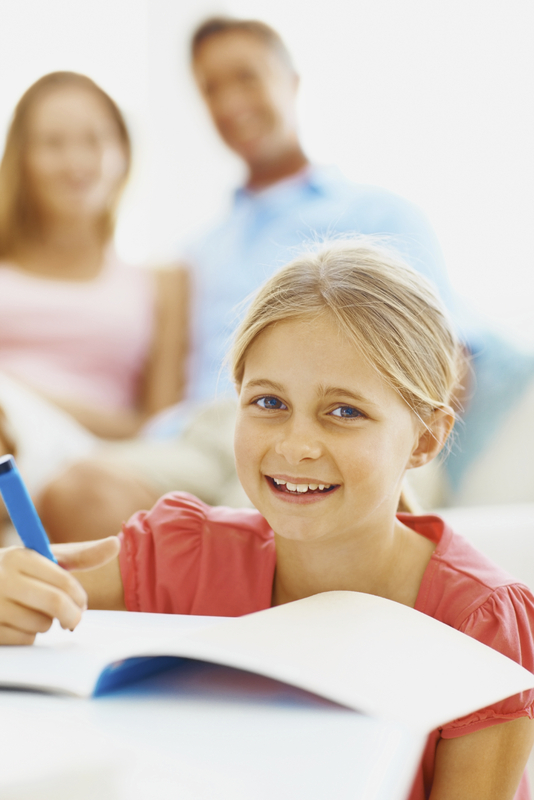 VISION could be the key to your child’s success. My son Kevin was really struggling with school and I had tried everything – tutoring, extra help at school, and OT – nothing seemed to help. It wasn’t until a friend recommended Vision Therapy at Home that I found the answer I was looking for. Now after completing the program, Kevin is much more confident in his abilities, he is starting to excel at school, and we no longer have the nightly homework battles. I would definitely recommend the home vision therapy program! It was a commitment for our family but I am so glad we saw it through. It was worth every penny and moment we spent on it. Thank you for giving me my child back! It was so frustrating seeing my daughter struggle through elementary school. I knew she was bright but her performance didn’t reflect this. Once we started the program, improvement was slow and gradual at first. It was not until we were halfway through therapy that I noticed considerable changes. Claire was often exhausted after a day of school. That has stopped completely. She loves to read now and can’t get enough. I can’t believe the differences! She is a happier child and I’m a happier father. I am so thankful for Vision Therapy at Home and recommend it to anyone who has the same concerns. I’m a true believer that seeing is more than just 20/20 vision. I am very pleased with the program. My son is 10 years old and is currently in the 5th grade. Over his 4th grade year, his reading was very bad as was his reading comprehension. His handwriting was pretty much illegible. Also, before starting the program, my son hated reading. Now he enjoys reading books and visiting the school library. His handwriting is fantastic! I am very happy with the results so far.